Are your partner scorecards created objectively using accurate, complete and timely channel data– or based on instincts/estimations you rely on upon without internal verification? Channel partner score “carding” is rapidly gaining acceptance as a best practice in Channel Data Management. As with any practice, it can be done well, or poorly; however, it can’t be done well without clean, accurate and standardized data as a solid foundation. If you already have a scorecard, is it doing everything you need it to? 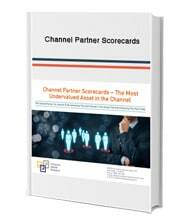 The ideas expressed in this eBook are designed to improve your score carding process while gaining a deeper understanding as to what makes a channel partner profitable—and why seeing isn’t always believing. Let’s explore this subject in greater detail by downloading the eBook on your right. “CMR is unquestionably one of our best partners. When we sit down with CMR and look for ways to solve a challenge, I feel that we connect with them in a spirit of true partnership.